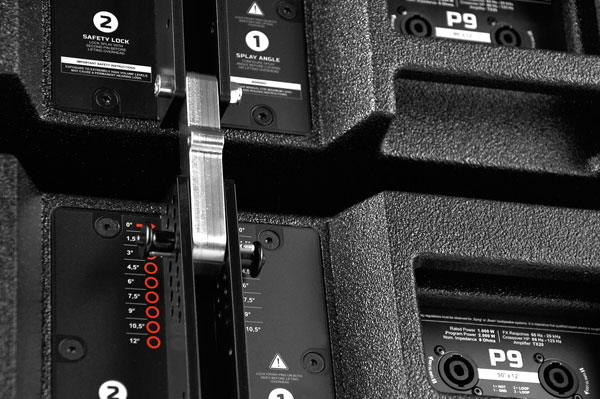 The P9 line array module features a dipolar arrangement with two 8” neodymium transducers and a high precision 1.4” HF compression driver mounted onto a waveguide with 90° x 12° dispersion. Both 8” transducers feature an extremely stiff UPM (Ultra Precision Membrane) carbon membrane design, which raises the particial oscillation to an inaccessible frequency range and reduces distortion to a minimum. The superior membrane damping is increased to a maximum, while natural oscillation is lowered to a smallest value. The UPM design further enables for increased speaker power capability of 500 W (RMS) for each single transducer. The P9 loudspeaker cabinet includes a passive 2-way crossover, which ensures for high efficiency in system cabling and amplifier configurations. 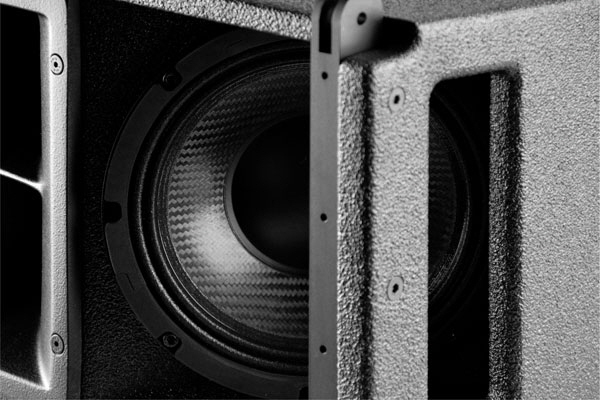 The advanced bass-reflex ports eliminate side lobes, which usually occur with 2-way line array systems. The ground-breaking ECD design (Extended Coverage Design) ensures for a very precise mid-range coverage. The V-arrangement of the two 8” transducers and the two additional outlets at the sides extend the horizontal dispersion of 90° at the typically critical frequency range between 700 Hz and 1.100 Hz. The vertical coverage of 12° allows for a basic system setup with four cabinets only. The acoustical and mechanical design enables vertical arrays of up to twentyfour P9 modules. The verticals splay angles are adjustable from 0° to 12° in steps of 1.5°. The cabinet is constructed from marine plywood and is covered with weather and impact protecting NPP (Nova Polyurea Protection) finish. The front of the loudspeaker is protected by a robust metal front grill with acoustically transparent foam. Each side includes one handle while two additional handles are included at the rear. The integrated three-point rigging hardware is recessed into the cabinet enclosure. The SLS (Splay Lock System) rigging technology makes splay adjustment to a walkover in two steps only, configuration and locking. The P9 loudspeaker can be used for a wide range of applications, such as for stadiums, theatres, dance clubs, festivals, corporate events and churches. Rigging as easy as it could be. Open the touring cart, pre-select each splay angle, lift the array and lock the rigging system. Two additional outlets at the sides extend the horizontal dispersion of 90° and ensure for a very precise mid-range coverage.